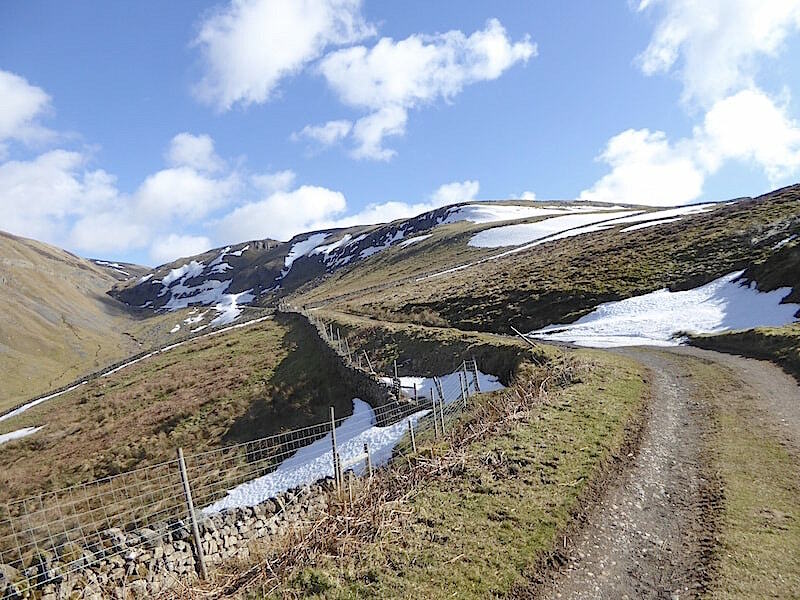 Today looked like being the last of the settled weather days before the temperatures start to drop back down the scale again and the wintry showers and winds return just in time for the Easter weekend, or so the forecast informs us. The heavy snow falls and strong winds of recent weeks kept us from walking anywhere across to the east of us so we used this good weather day to take an out and back walk up Great Rundale. 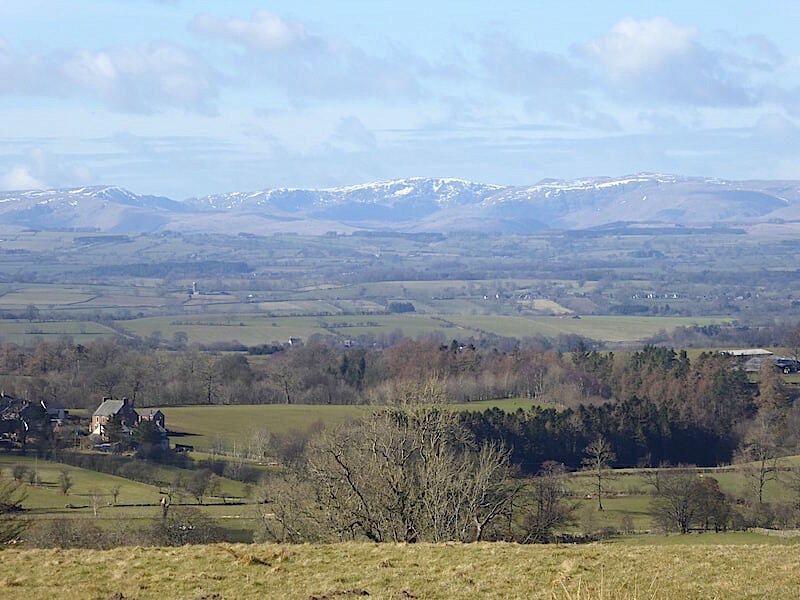 The walk starts on the eastern side of the Eden Valley in Dufton, a small village nestling at the foot of the north Pennines, and a drive of just ten miles across the valley from home. 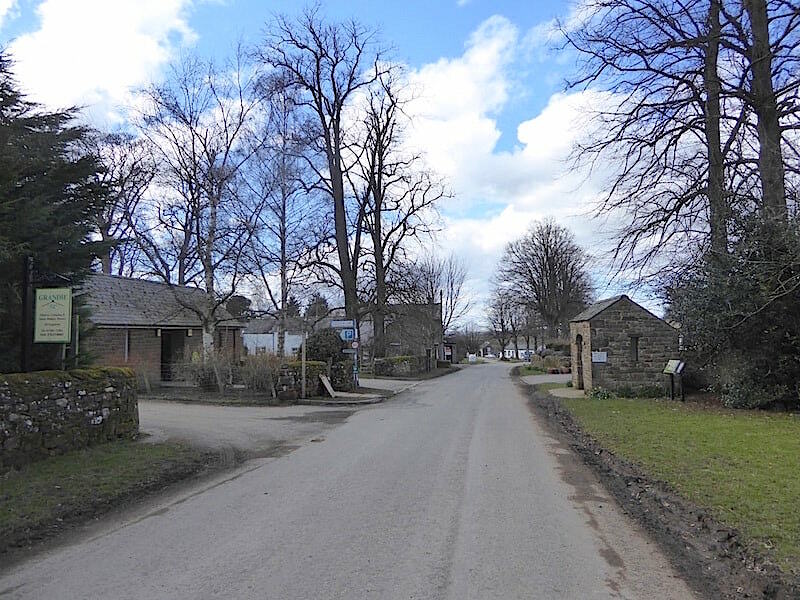 There is a small and free car park at the top of the village and if that is full there is plenty of roadside parking, although it can be busy at weekends, especially on Sundays as The Stag Inn does a very nice Sunday roast. Before we started out we had a chat with a local resident, out walking her dog, who told us how severe the snow and the winds had been for the village and its residents. 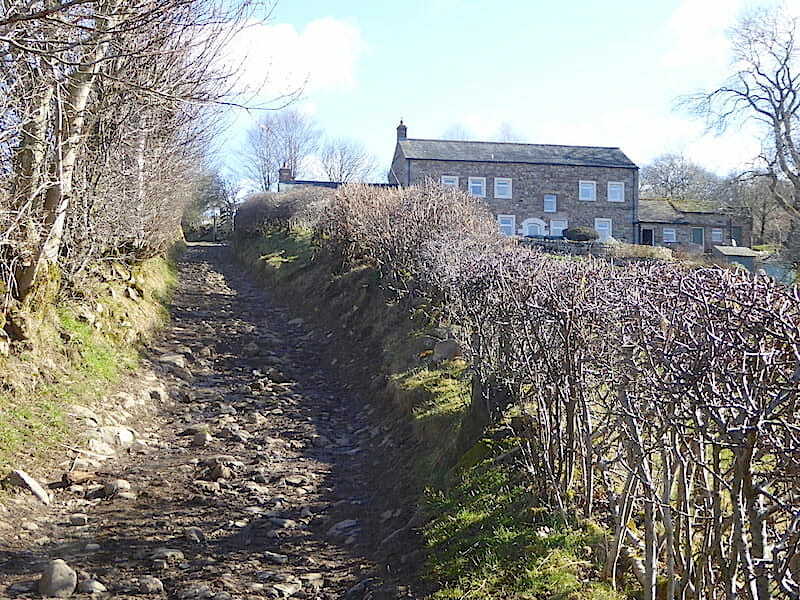 They had been unable to leave the village for four days as the lanes leading into it were impassable, and there was hardly a property which hadn’t suffered some damage, be it major or minor, in the ferocious winds. Apparently the roof of a farmer’s barn had been blown off during one storm and had landed smack on top of the farmhouse itself. 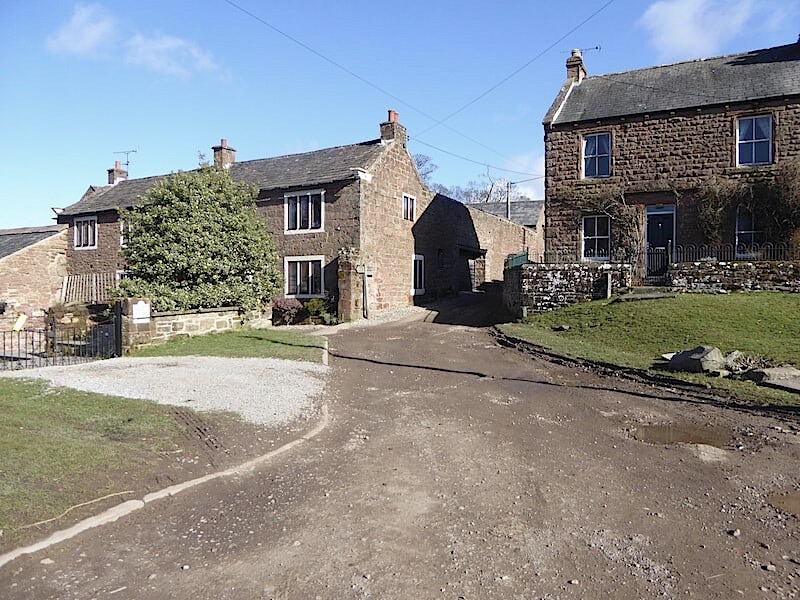 We turn right out of the car park and follow the road curving round the top of the village, the road continues off to the right but we leave it here and carry on along the lane between these two houses. 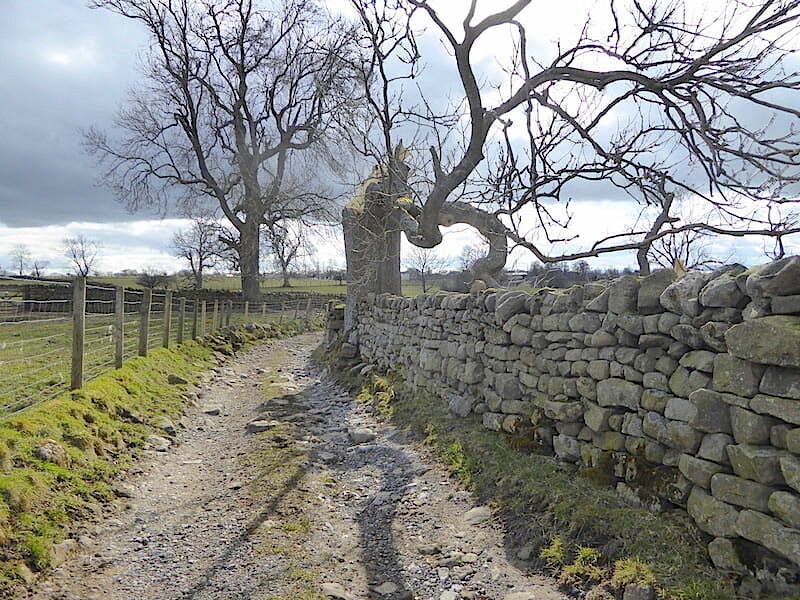 A signpost for High Scald Fell stands by the end wall of the house on the left. The lane, firm and dry to begin with, became very wet and muddy a little further along having been churned up by farm vehicles driving along it. Beyond the little stream at the bottom of the lane out of the village the path became a little rougher and stonier and became much less muddy as it began to rise gently. 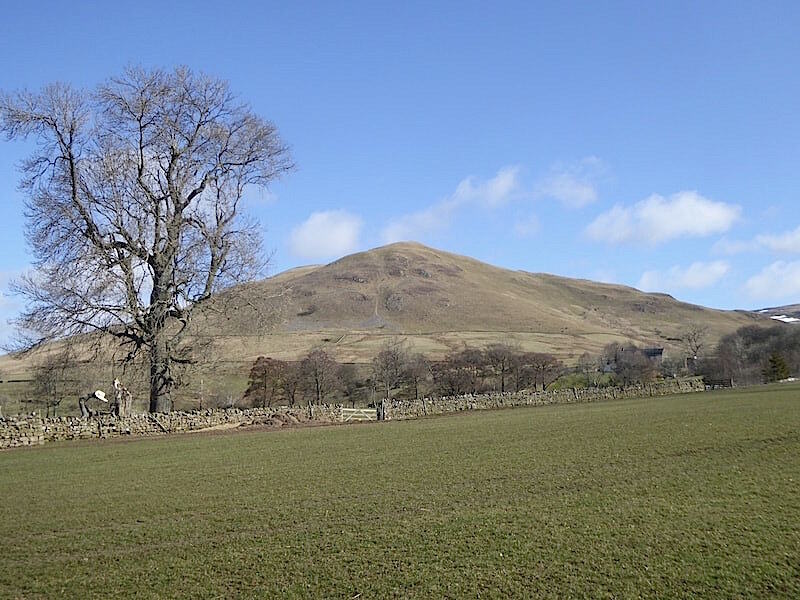 The path is behind the wall in the shot but to get a good shot of Dufton Pike I walked a short way into an adjacent field. The field was empty of sheep and the gate had been left wide open so I convinced myself that I wasn’t actually trespassing. 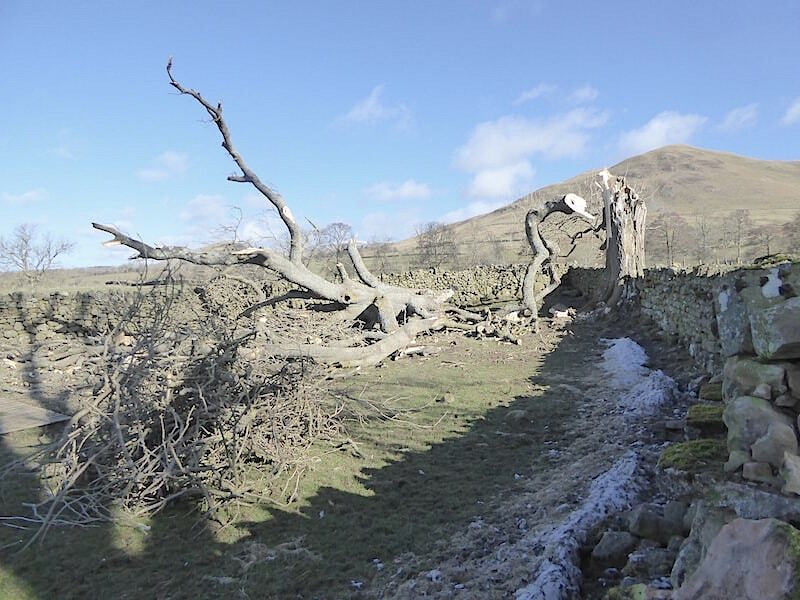 We came upon this sad and forlorn sight as we carried on along the walled lane, a fine old ash tree which had fallen victim to the vicious winter winds. 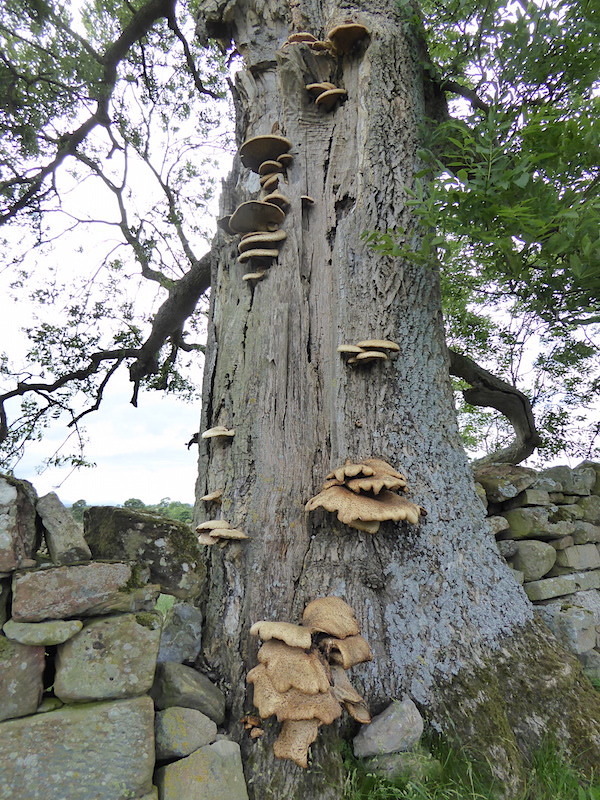 I took a photo of this tree on our Dufton Pike walk in June 2017, this is what it looked like then …..
….. it must have weathered many a storm in the years it has been standing here, but it couldn’t withstand the battering dished up by ‘The Beast’. 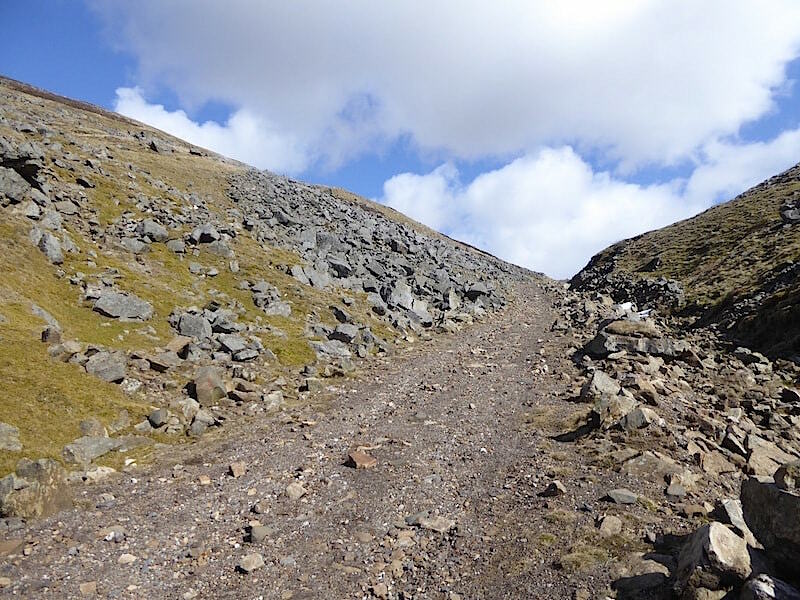 Climbing the very rough track up to Pusgill House. 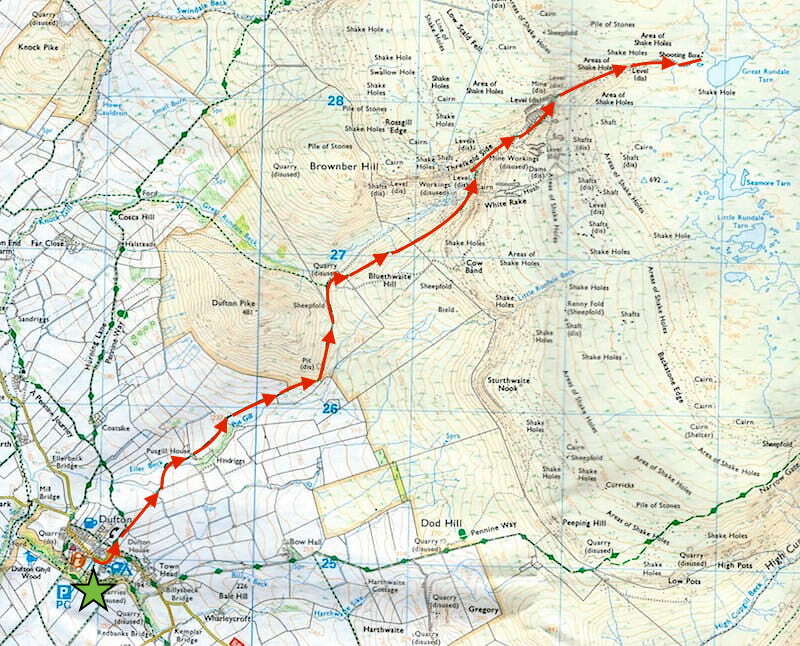 There appears to be no other way up to the house from the village which must make for a very bumpy ride up to it. There was a car parked off the path opposite the house, to the left of the track, but it wasn’t what could be described as an all terrain vehicle, just a fairly run of the mill family saloon. 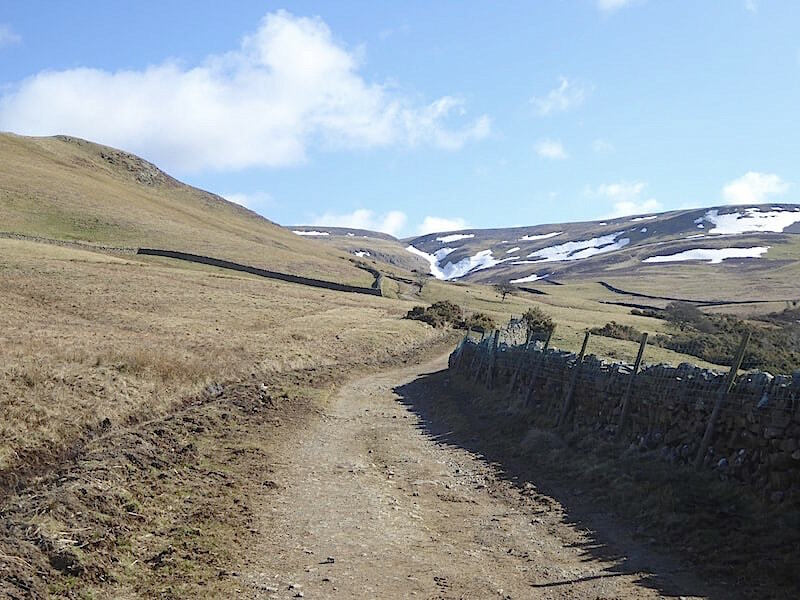 The track continues to rise steadily, but you almost don’t notice it until you realise that somewhere along the route that your breathing has become just that little bit more laboured than it had been. Behind us the sun was catching the snow on the High Street group of fells so I zoomed in for a better view. 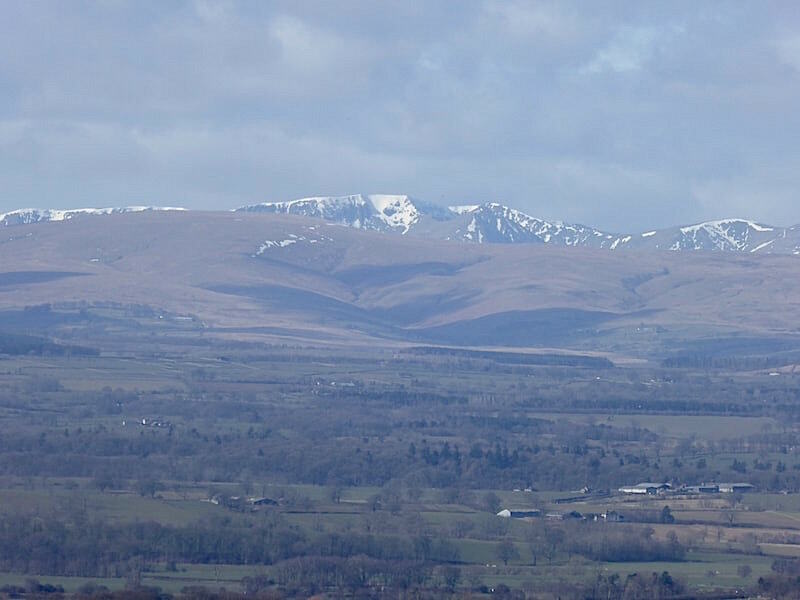 Further round to the right and another zoom shot as the same thing was happening on the northern fells where Blencathra stands out most prominently. 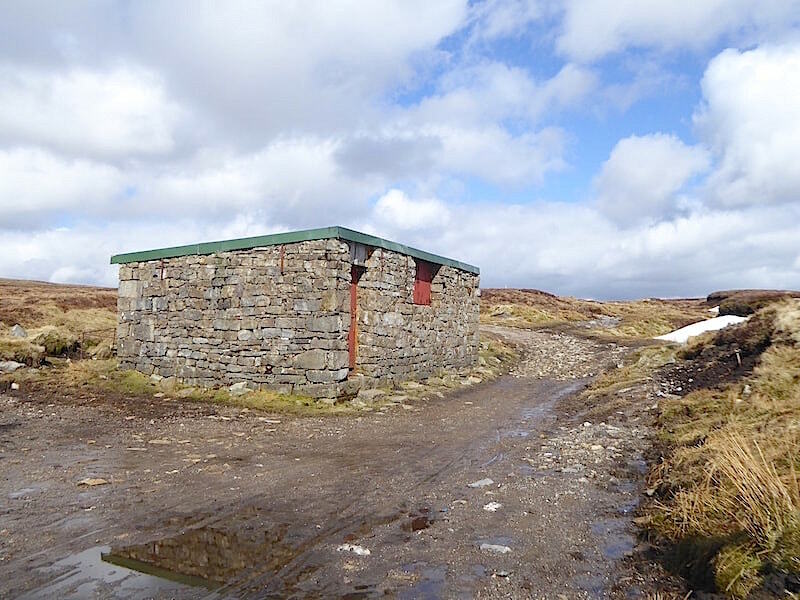 The track levels out again as it reaches the gate and the corrugated hut full of farming odds and ends. 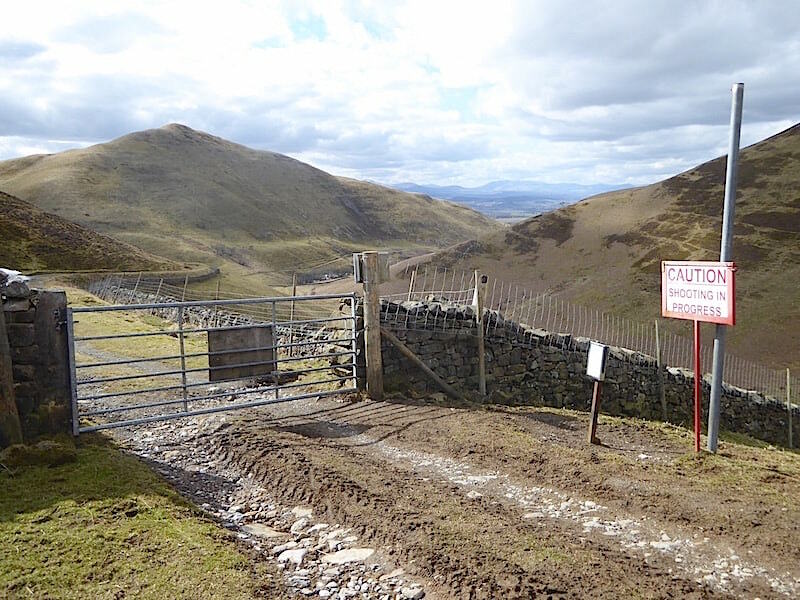 We continue on past the closed gate across the more open landscape. The walk up through the walled lane is very pleasant but it was quite warm walking along it and it was nice to be out in the open again. On the basis that it would be as fine and warm as it was on our last walk I took the summer weight trousers out of their winter hibernation drawer and also brought a much lighter jacket. The jacket has been in my pack since we left the car park, its much too warm to wear it at the moment. 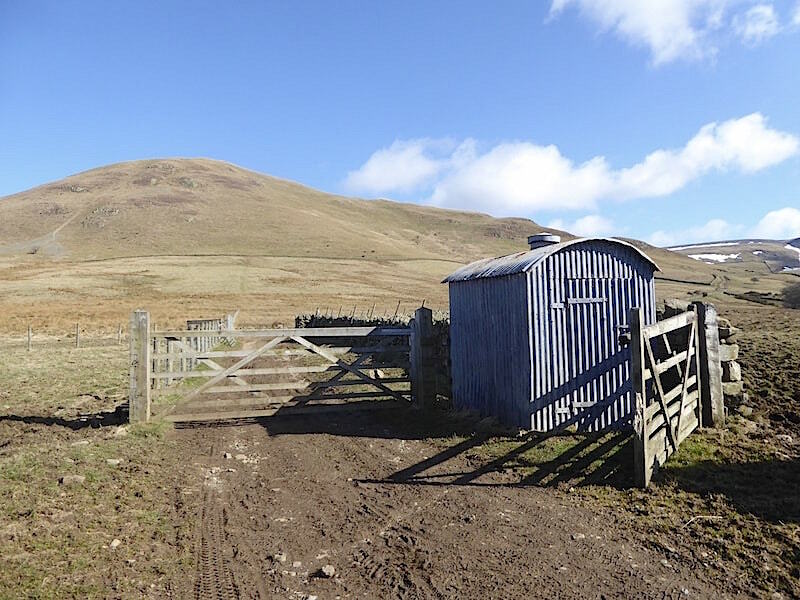 From the gate and the hut there’s a very pleasant walk, over the gentle gradient which skirts around Dufton Pike and then leads over to Great Rundale Beck. 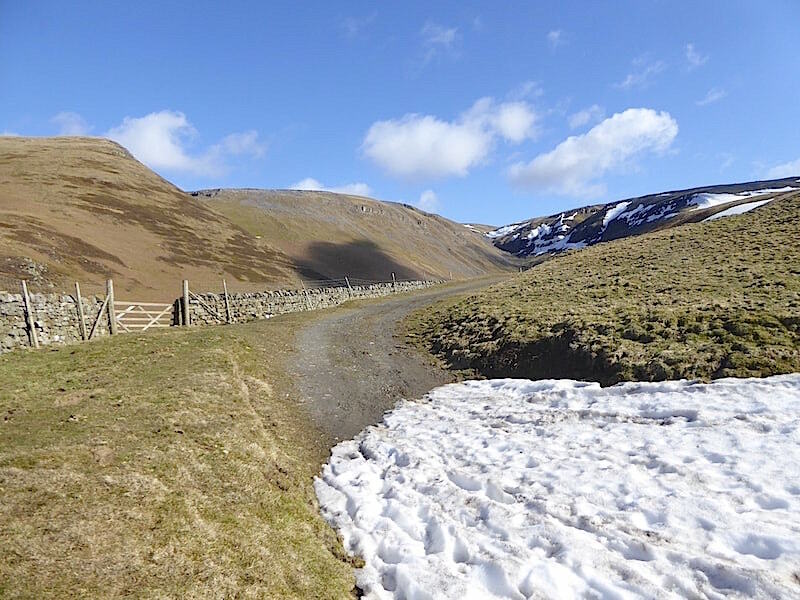 The gully in the centre of the shot is Little Rundale Beck and we are slightly concerned at the amount of snow we can see still blocking it. 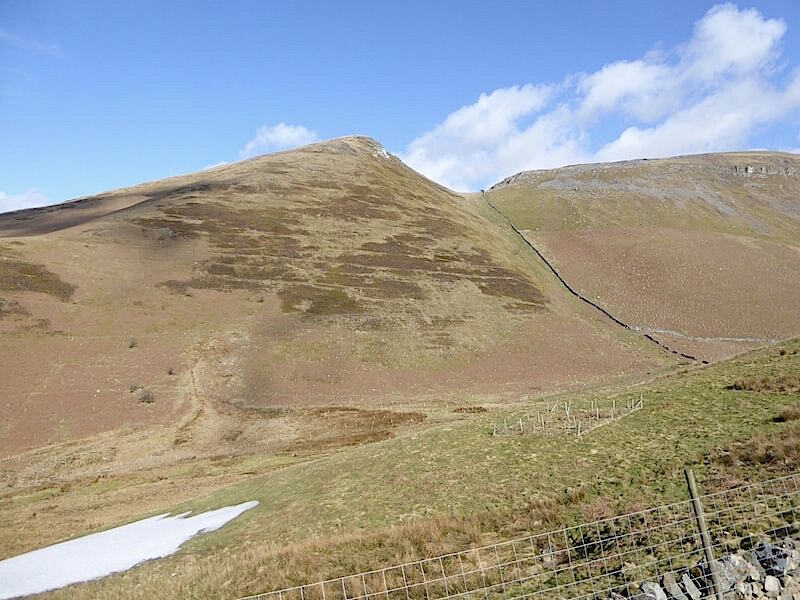 We have no way of knowing what Great Rundale will be like as it is well hidden behind the back of Dufton Pike and we won’t see anything of it until we are about to enter it. 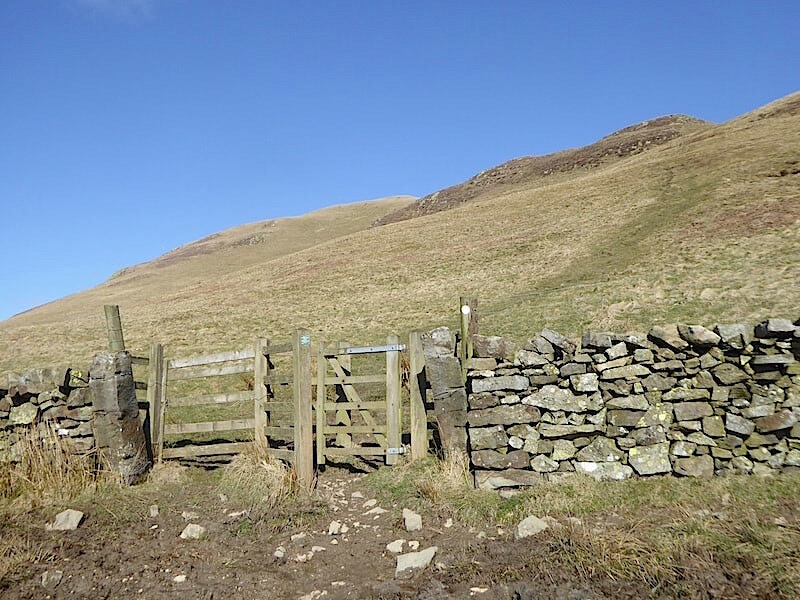 As we pass the access gate for the path up Dufton Pike we consider the fact that this walk up Great Rundale might be over before its even got properly started and begin to consider our options. 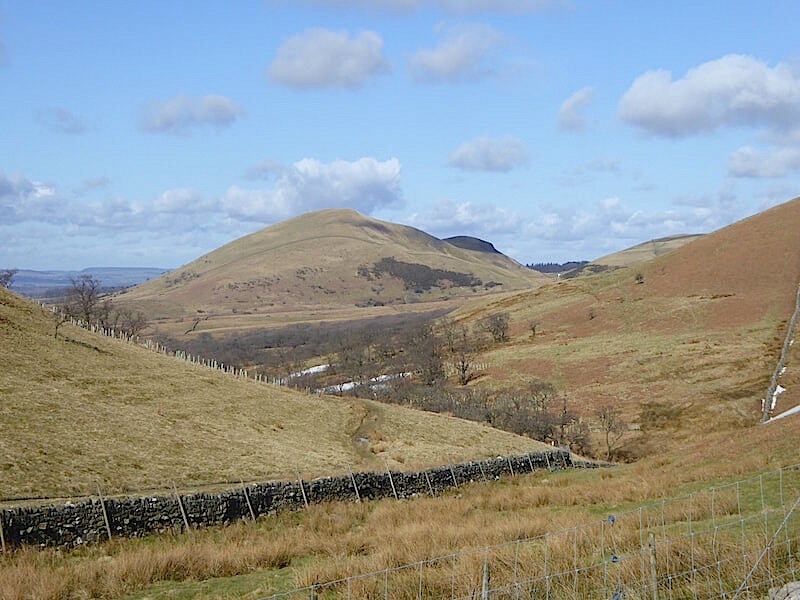 Brownber Hill, Dufton Pike and Knock Pike are all very close together and so we decide that should Great Rundale be a non-starter we can always cobble together a walk which includes all or some of those fells instead. With Plan B more or less organised we carry on and hope for the best. 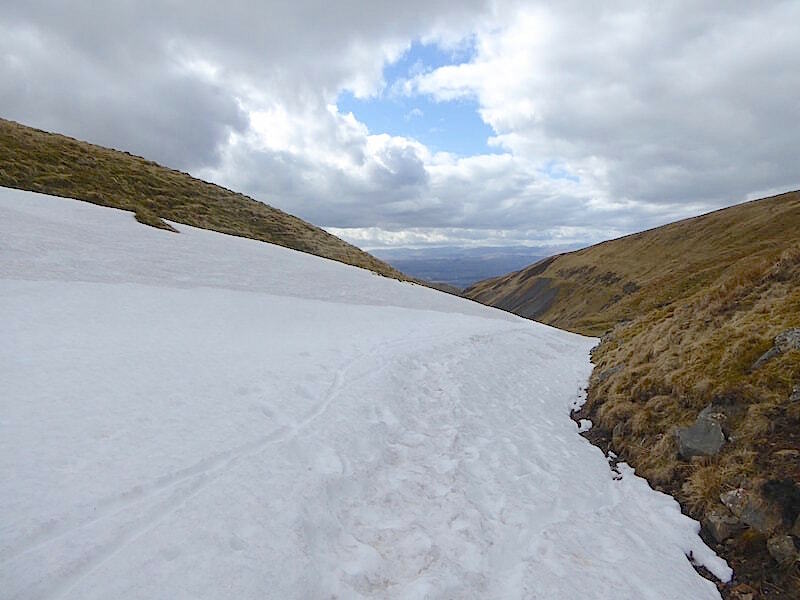 On the distant skyline the sun is still bouncing of the snow capped Lake District fells, this time I zoomed in on Helvellyn, in the centre, which still has plenty of hard and compacted snow in many places. 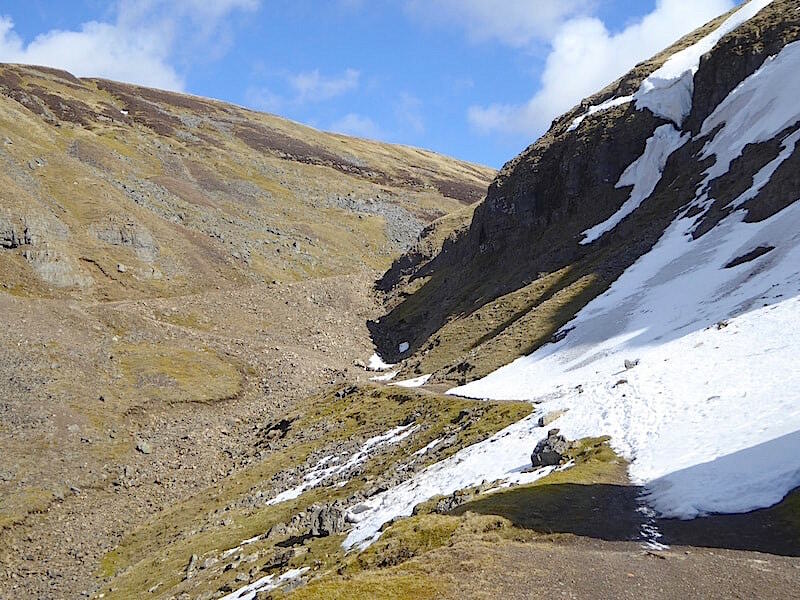 The Fell Top Assessors, who go up there every day to check the conditions, are still issuing warnings that walkers should still be fully and appropriately equipped for the winter conditions they will come across up there. 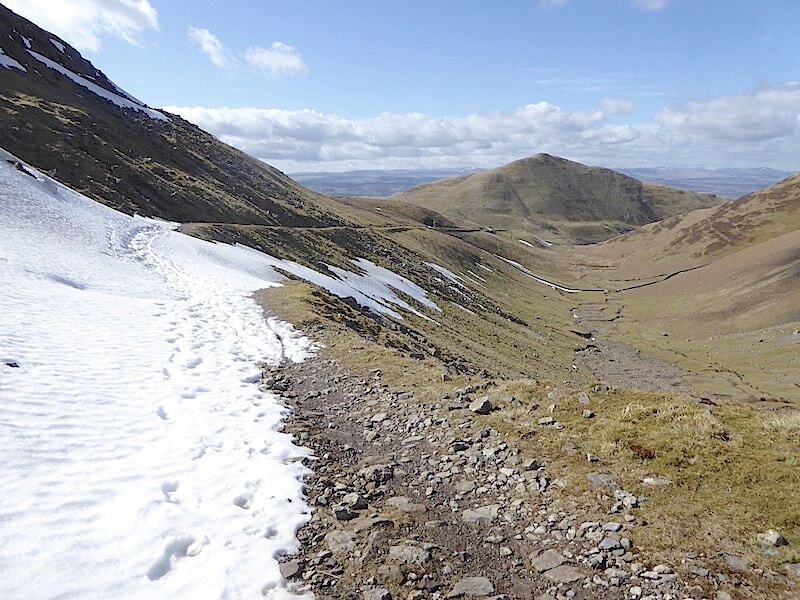 The path begins to turn northwards around the foot of Dufton Pike and we take another look across to Little Rundale Beck and its snow packed gully. 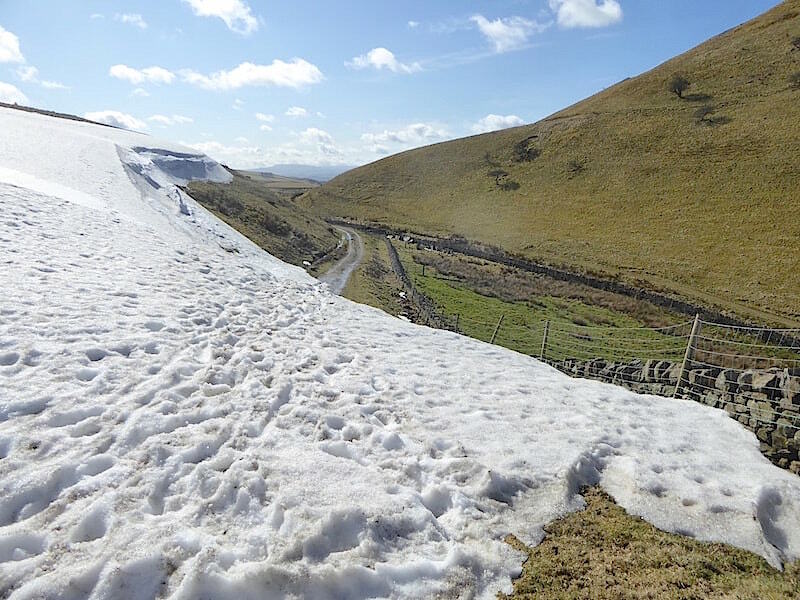 Even though we’ve turned around the foot of Dufton Pike we still can’t see what the conditions are like in the valley thanks to the long, low and snow patched slope of Bluethwaite Hill. 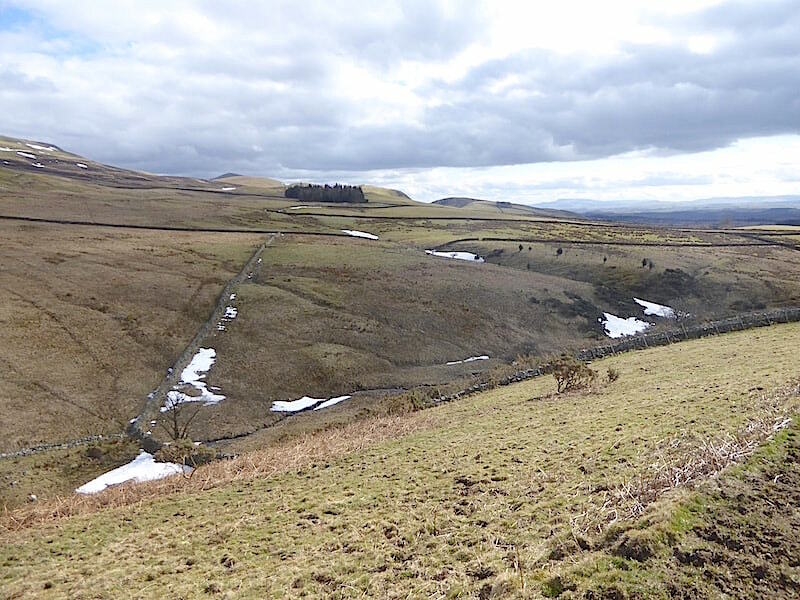 Brownber Hill and High Scald Fell on the skyline are almost completely snow free. 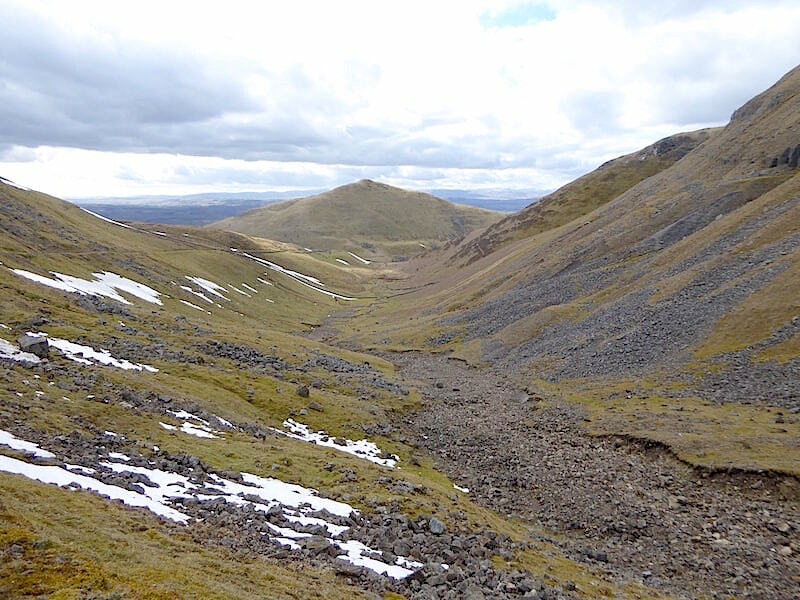 Knock Pike appears between the lower slopes of Dufton Pike and Brownber Hill on our left as we approach the bend in the path. Oh-oh, this is not what we wanted to see, a large and deep snowdrift lying across the path just where it begins to turn up into Great Rundale. How far does it go? There’s only one way to find out but before we do …..
….. 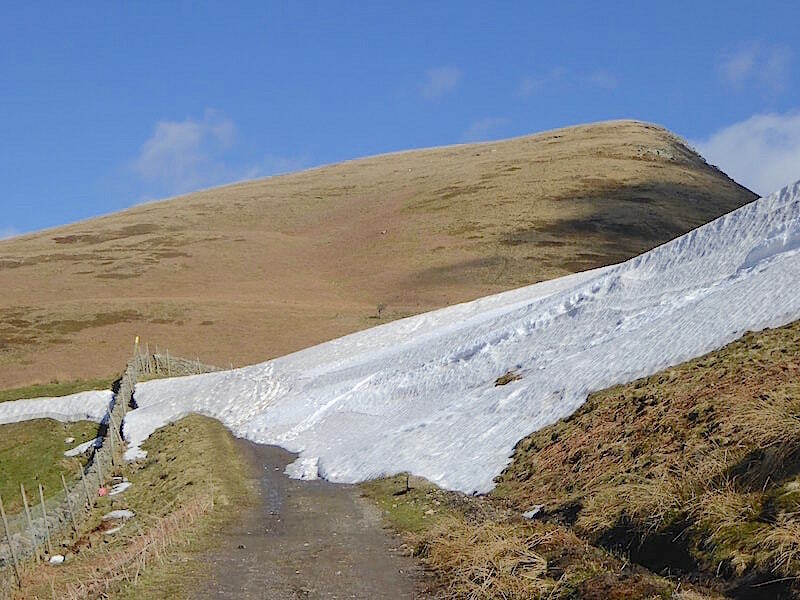 I take a look up at the layers of slabbed snow above us on the slopes of Bluethwaite Hill hoping that this warm sunshine wouldn’t be melting them enough to start them sliding, they were quite thick and looked somewhat unstable. Fortunately the drift wasn’t very lengthy and last night’s frost had kept it firm and crisp so using the existing footprints we crossed over without too much difficulty, just a bit of a slither a couple of times that’s all. 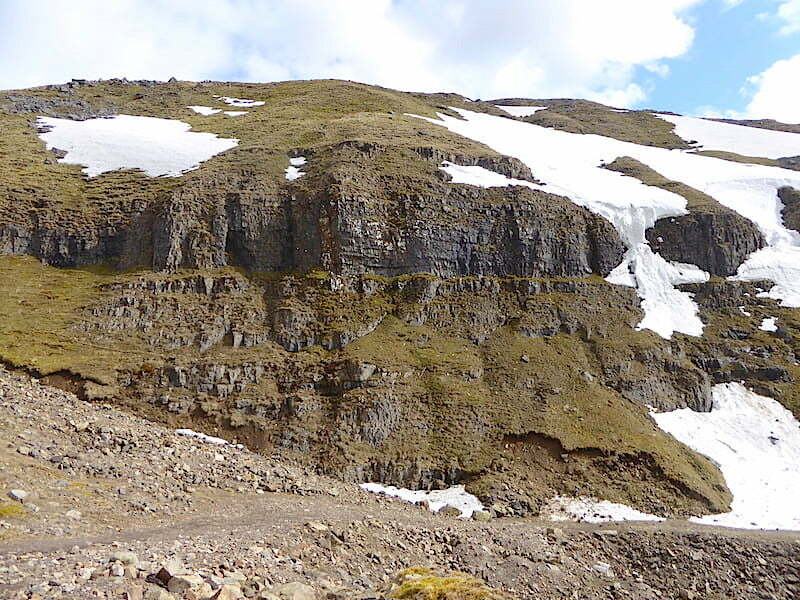 Some intrepid soul had recently left their footprints across the banked snow on the left. 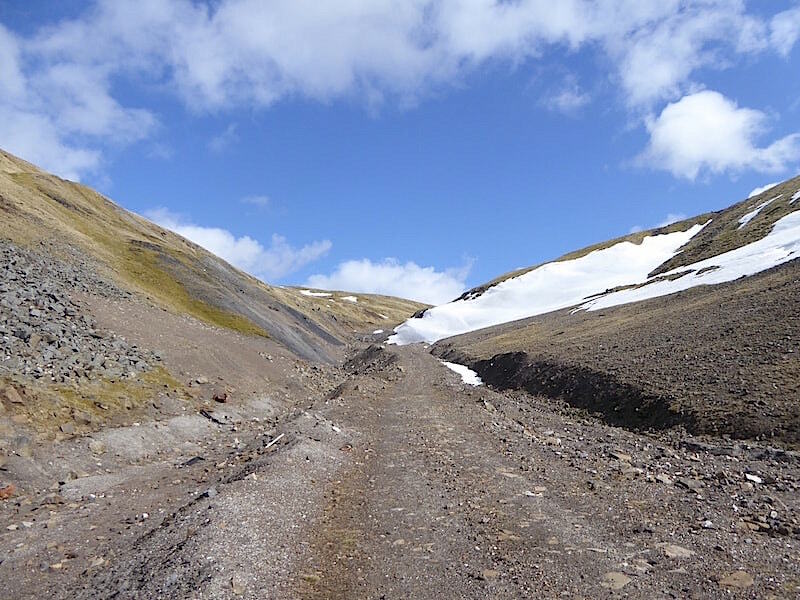 Once across the drift we turn into Great Rundale where the old mine track looks to be snow free and niggling doubts about being able to carry on disappear. The sun is shining, the temperature is rising, there’s little breeze and we take to the very long mine road in good spirits. 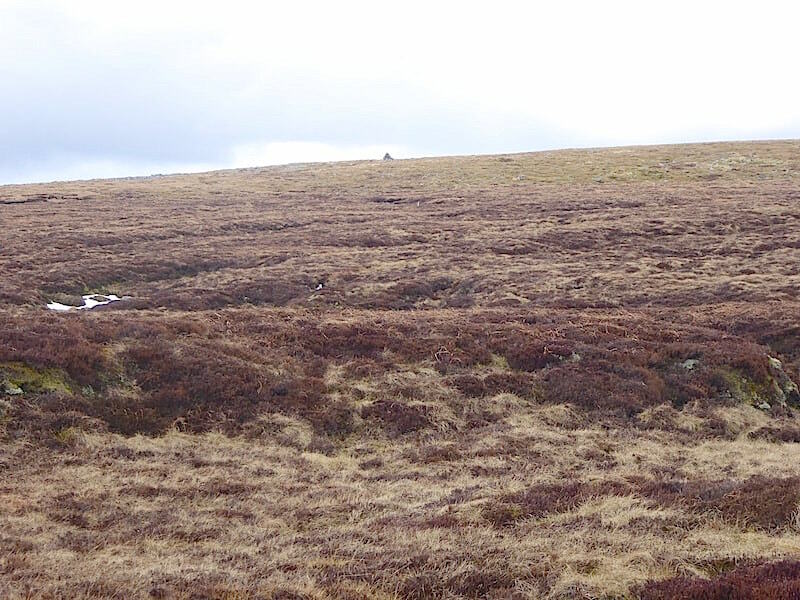 Brownber Hill with the long wall rising up to the little depression between it and High Scald Fell. Conversation turns to the skill, and endurance, of the dry stone wallers. It would be a nice day at the office on a good day like today though. 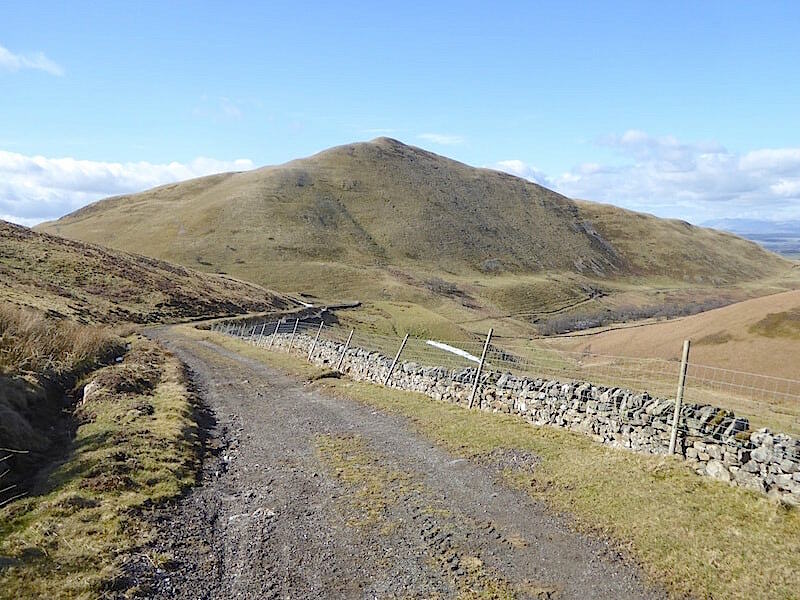 A look back at Dufton Pike as we carry on along the old mine track. From Dufton village up to the shooting box at the top of Great Rundale its a four mile walk along the gradually rising but straightforward route. The track is firm and dry so we’re able to maintain a steady pace for the moment. Looking ahead though there’s a distinct possibility that the pace may well be slowed or even halted before too long. 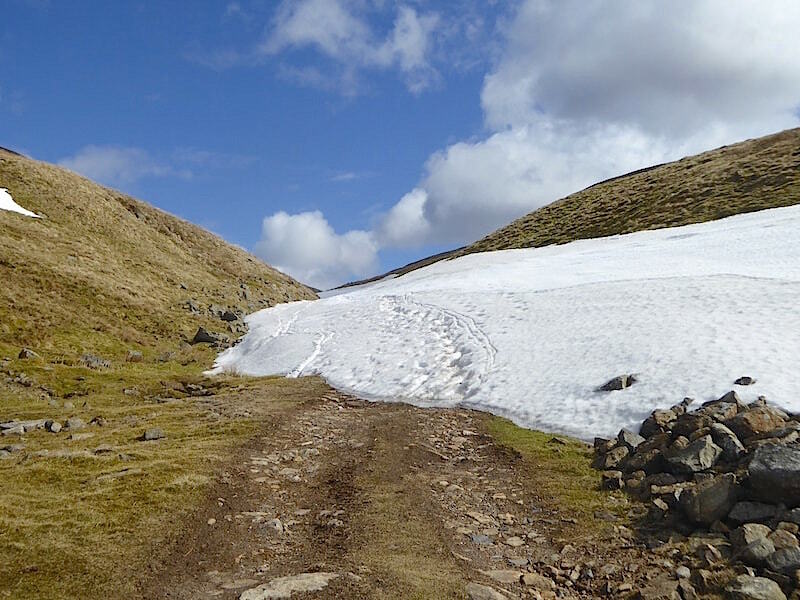 As it turned out our walk wasn’t brought to a halt although with another icy snow drift to cross it was prudent to step slowly and carefully …..
….. and it turned out to be rather longer than the first one we crossed back down the track. 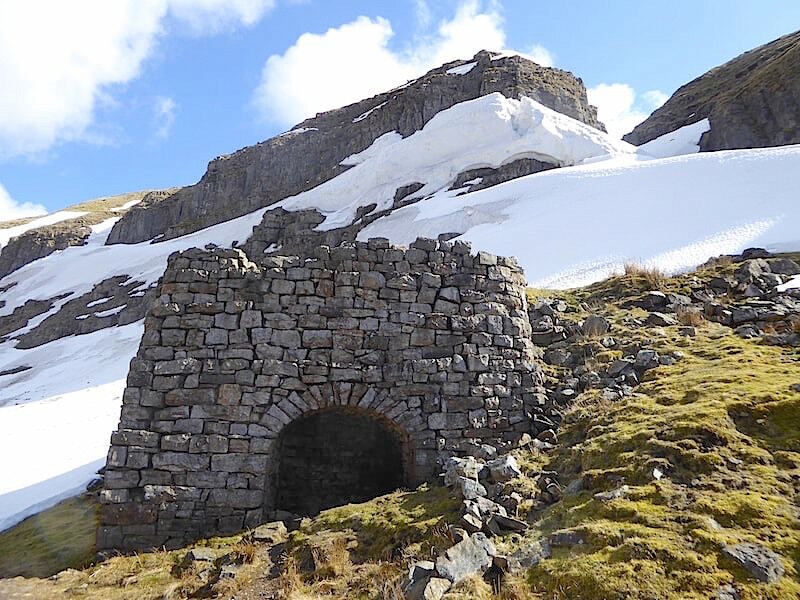 Back on the dry path again and approaching what looks very much like an old lime kiln. 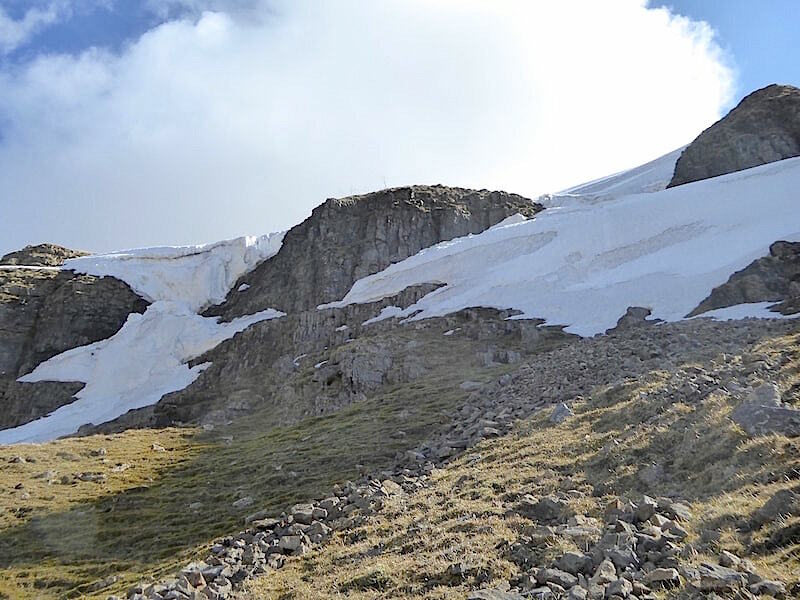 We weren’t tempted to take a closer look at the kiln or linger anywhere along here as some of the larger cornices above us were showing signs of slippage. We didn’t exactly tip-toe beneath them but we certainly avoided being excessively noisy, just in case. 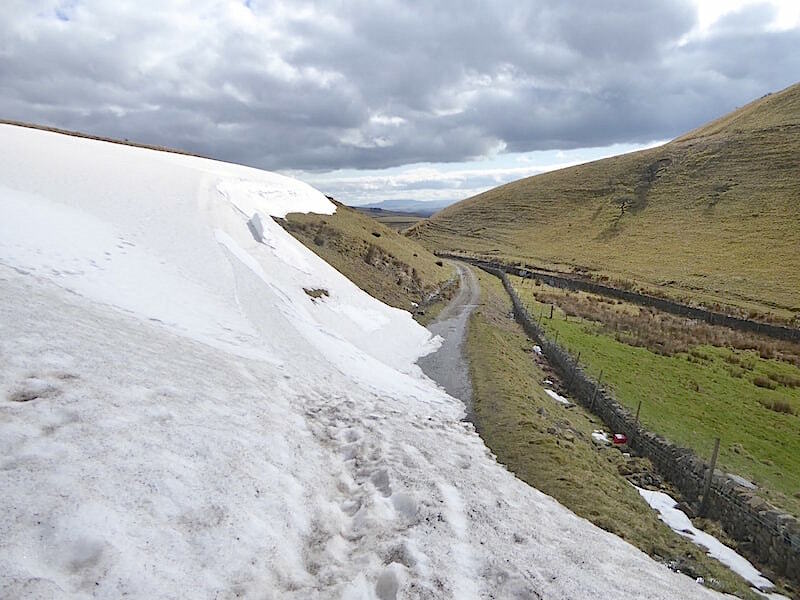 Another drift to negotiate a little further along from the lime kiln …. 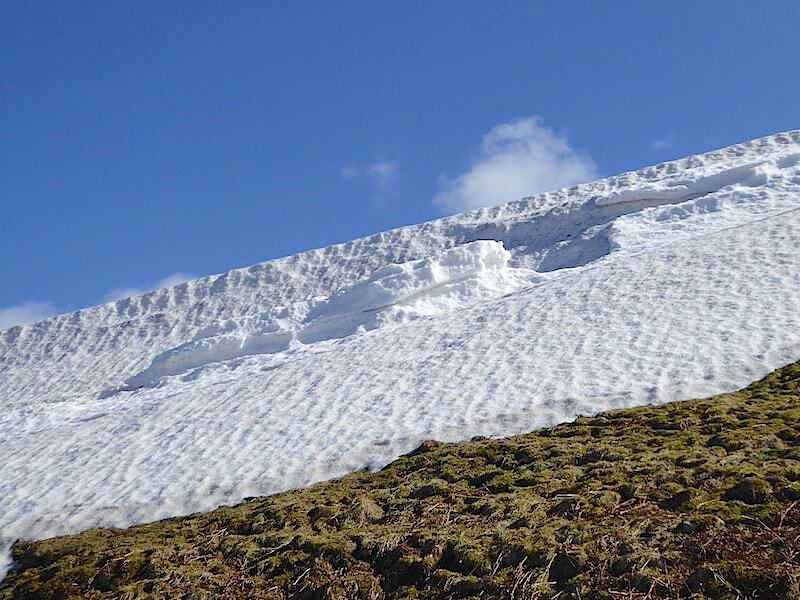 ….. above which were more large cornices and newer snow layers on the older frozen ones. You can never be sure about their stability though, they could quietly melt away without any fuss or something triggers a slide and down comes who knows how many tons of the stuff. 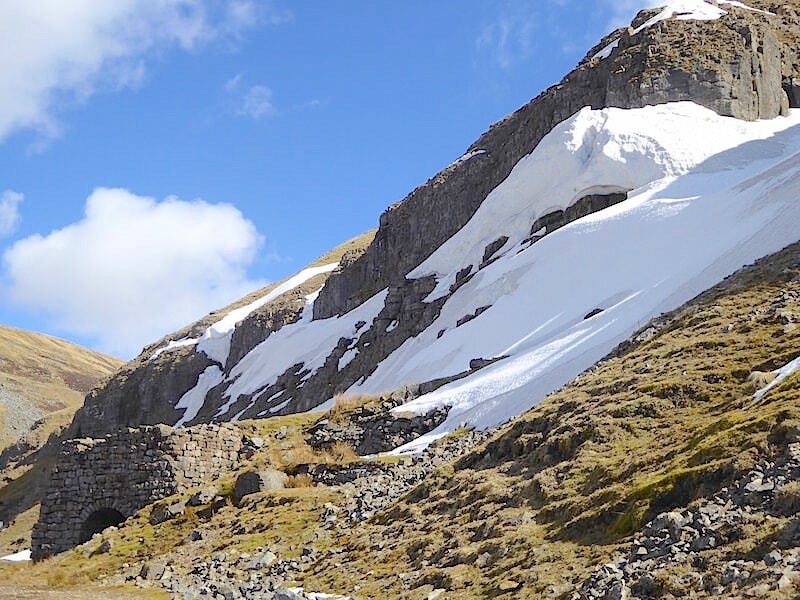 It was with some degree of relief to leave the drifted path and the cornices behind and reach the clear track through the old mine workings along Threlkeld Side. 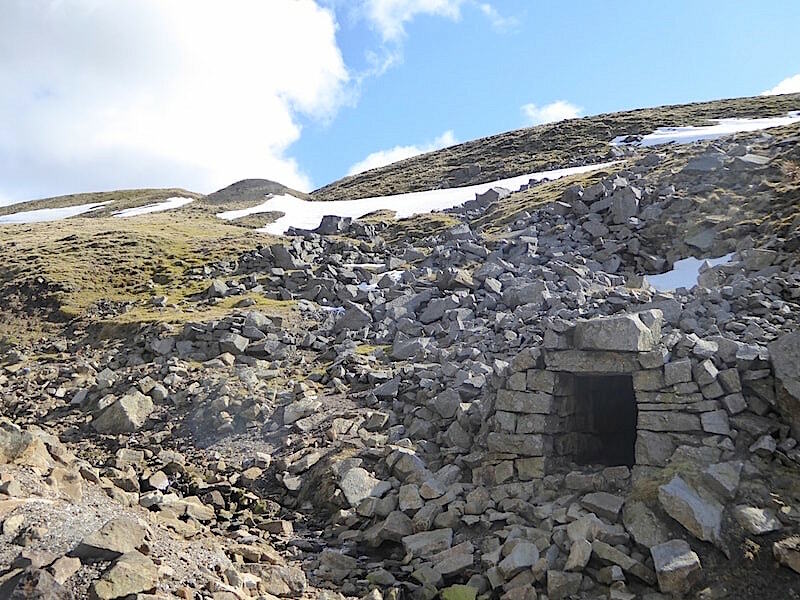 A former mine adit or level behind which was a large rock filled depression which suggested that some collapsing had taken place …..
….. and further up the track the ditches on both sides of it were littered with the rusty detritus of mining activity, together with more recent debris in the form of discarded plastic pipework. 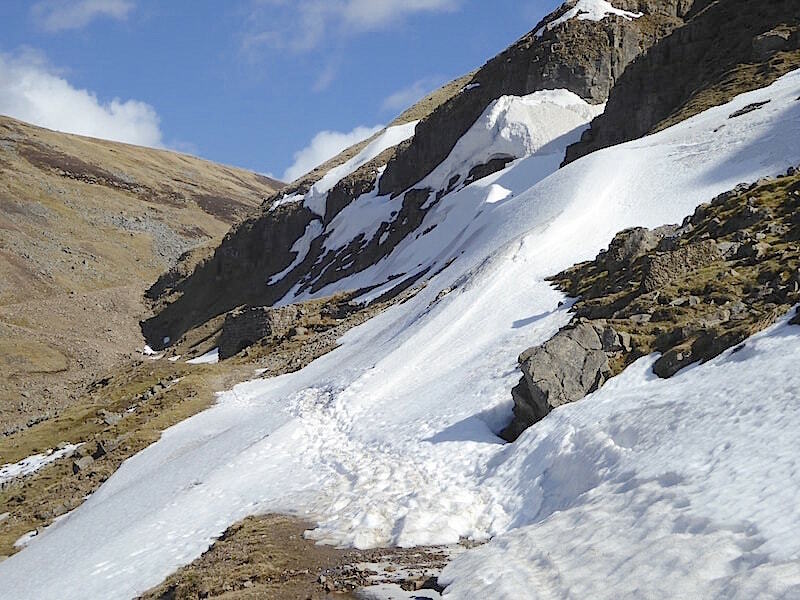 We come across quite a substantial drift a little higher up the path but side-stepped it across the very rough, but snow free, area alongside it. Two derelict structures, one above the other, did they once house some winding machinery we wondered? Another lengthy drift straddles the track. We considered taking to the grass alongside but the slope was peppered with rocks and outcrops and it was simpler just to go straight across …..
….. we eventually reach the top of the valley where the track flattens out considerably, and where the cloud has thickened, the wind is strengthening and the temperature has dropped a few degrees, time to put the jackets and gloves on. 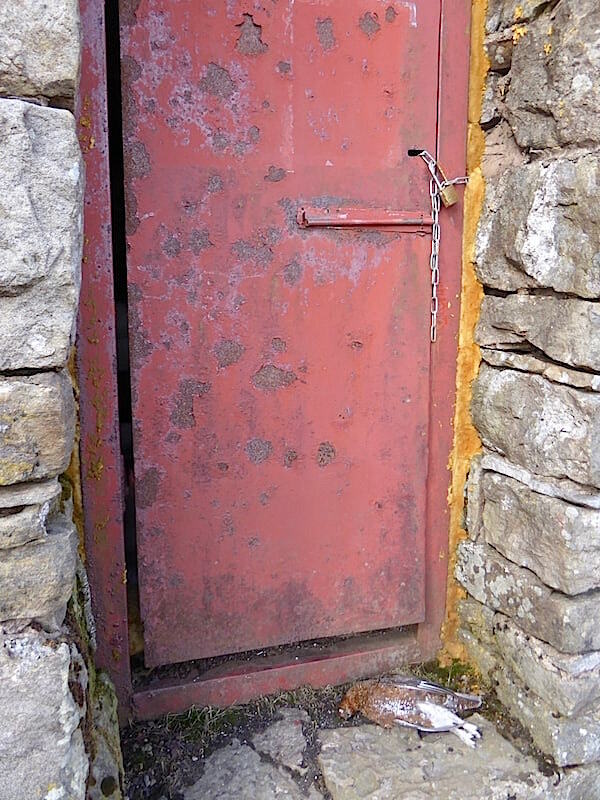 Just a short distance further on is the Shooting Box which would have been handy to use for a lunch break, unfortunately …..
….. the door was padlocked, and on the doorstep was a very recently deceased Red Grouse. A sad sight and hard to understand as it didn’t appear to be in poor condition. Natural causes we supposed as there was no indication that it had been brought down by gunshot. 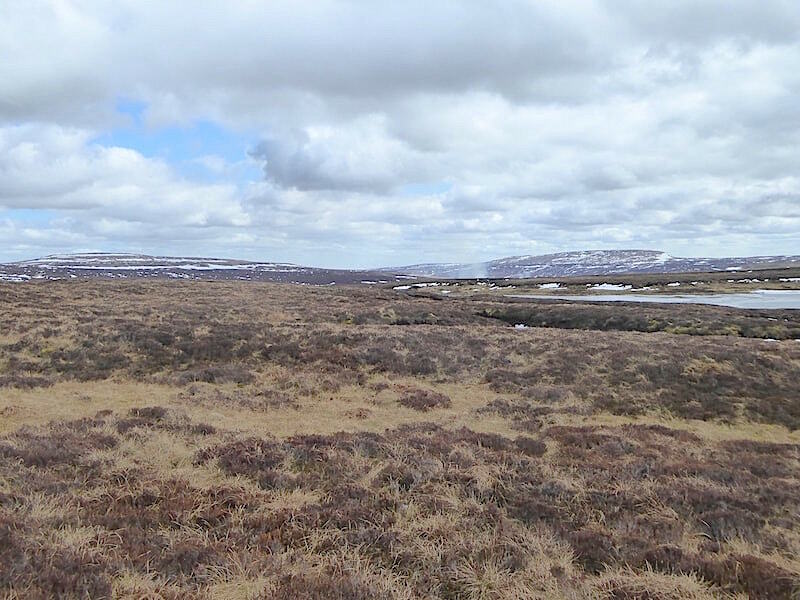 We had a short lunch break, out of the wind, behind one of the walls of the Shooting Box and then walked the short distance over to Great Rundale Tarn. 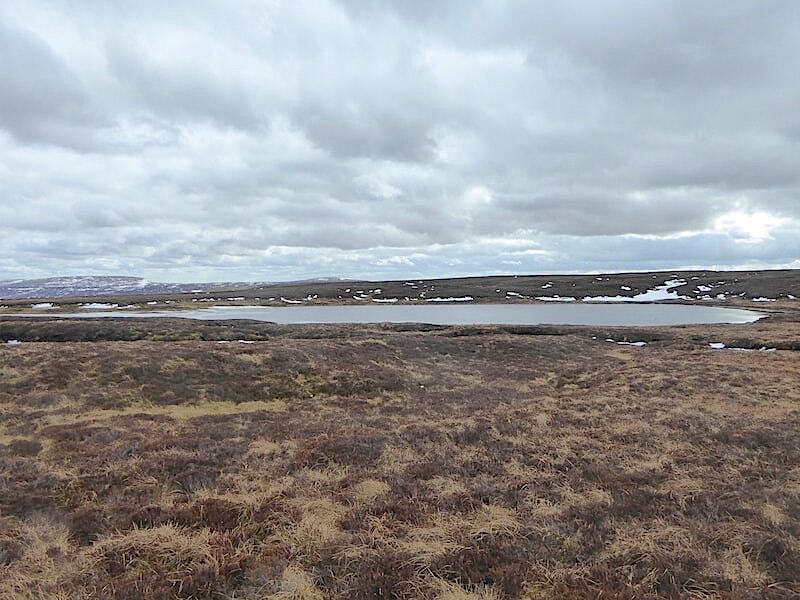 Its a very large tarn, more akin to a small lake, located high on the northern Pennines, at about 2290′, in the bleakest of settings …..
….. with wild moorland in all directions. 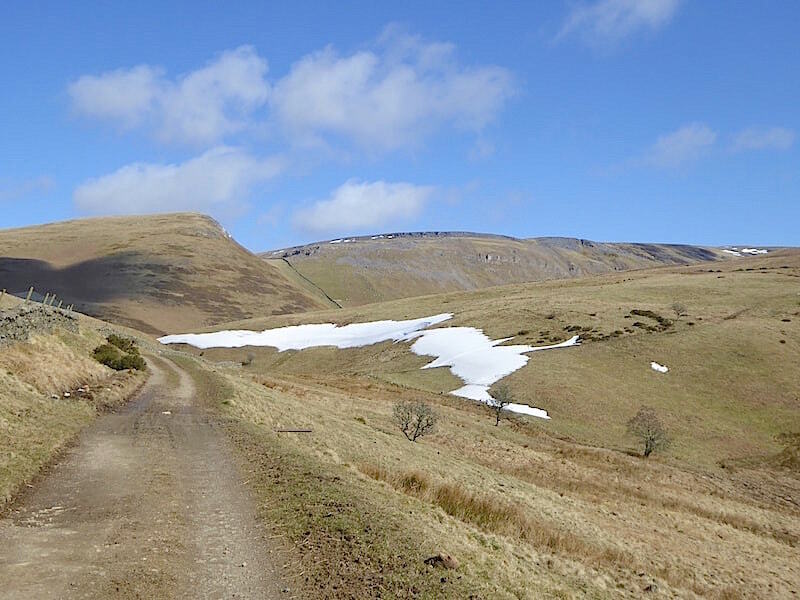 Following the narrow track in a south easterly direction would eventually lead you over to High Cup Nick hidden away between here and the distant Murton Fell …..
….. or you could head north west and aim for the marker cairn on High Scald Fell and make your way over to Knock Old Man to pick up the Pennine Way. Whatever direction is chosen the ground underfoot will most likely be on the soggy side. 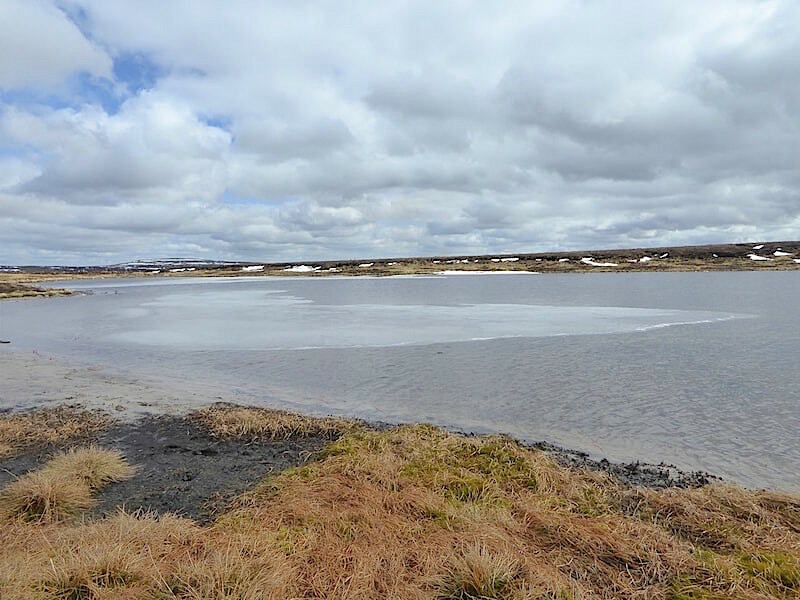 We braved the squelch to take a closer look at the tarn …..
….. which still had a large layer of ice across its surface. 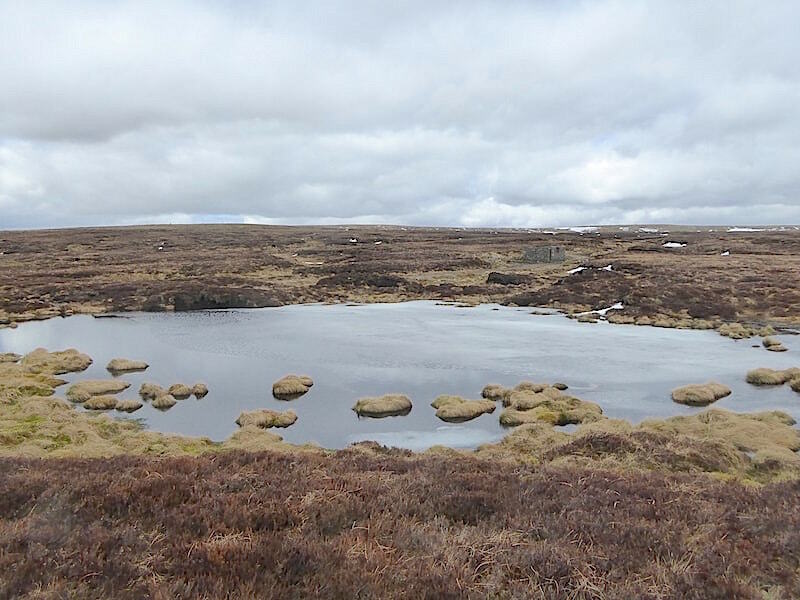 There are two more tarns to the south east but we had no plans to walk over to them today. A walk for a hot summer day perhaps, if we’re lucky enough get one. 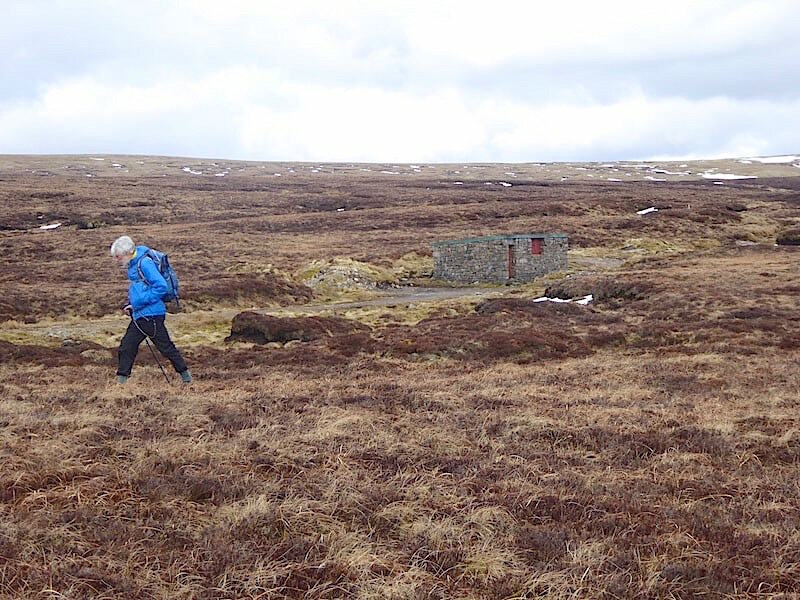 It became too chilly to hang around much longer so we began to make our way back to the path by the Shooting Box which blended in so well with its surroundings that it was hard to spot for a moment or two. 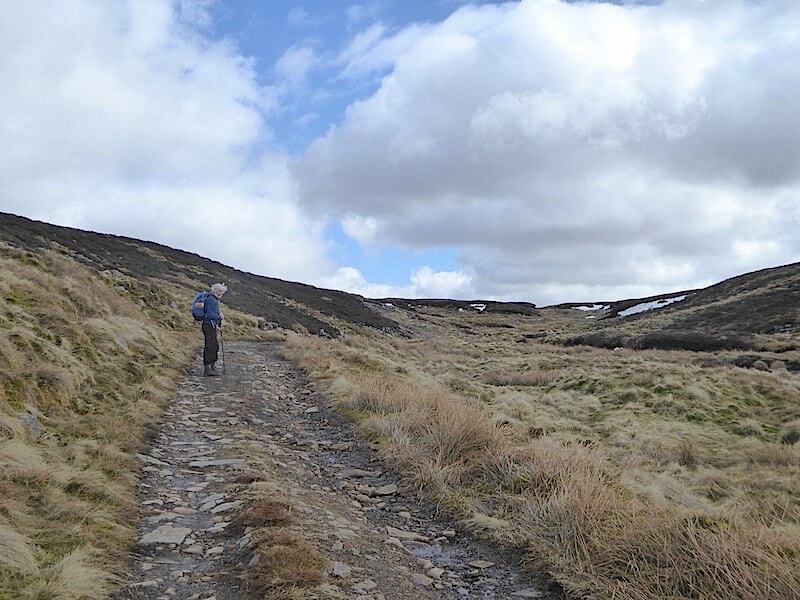 Trying to avoid the many small puddles and patches of squelchy marsh, and disturbing quite a number of grouse in the process, as we return to the solid footing of the path. 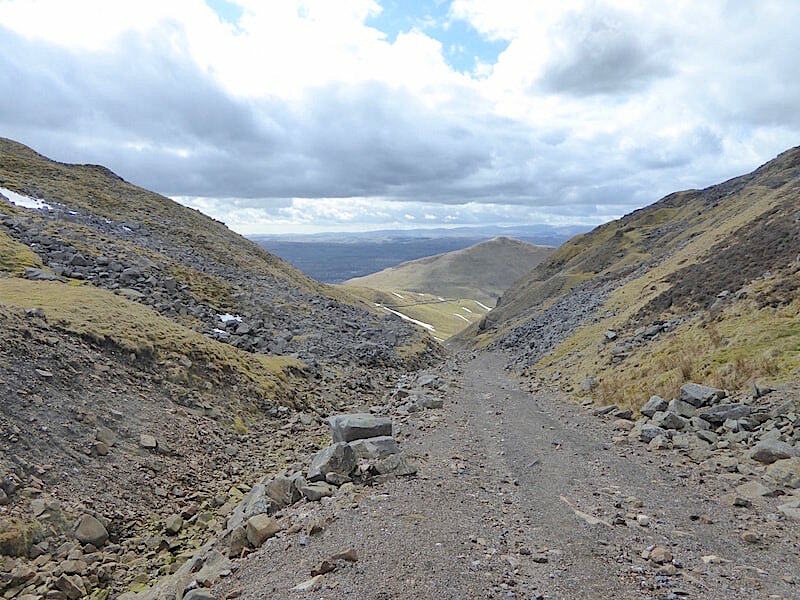 We start the return leg and, although the cloud has thickened considerably, enough sunlight is breaching the gaps to highlight a panorama of Lake District fells, stretching across the distant skyline from Dollywaggon Pike all the way across to Great Dodd. 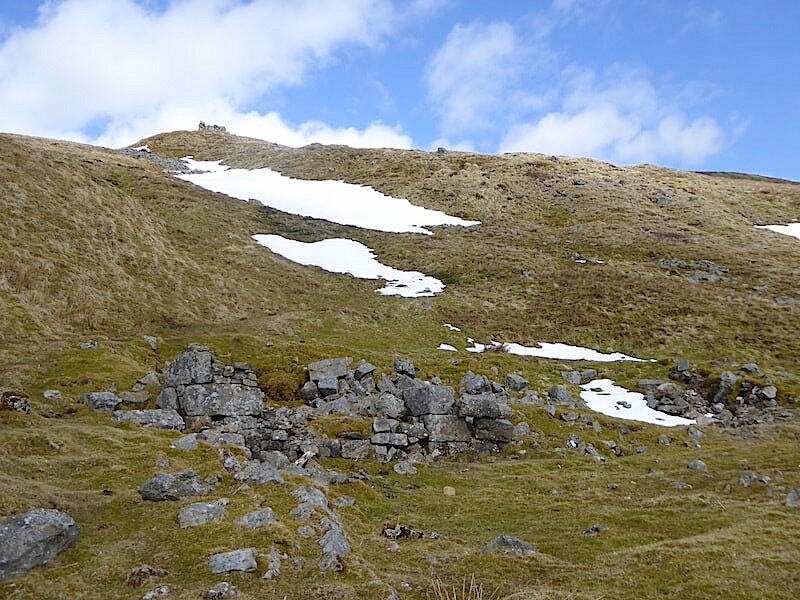 Having indulged in a spot of fell identification we retrace our steps and meet up with the snow drifts once again, we kept to the snow again rather than dealing with the rough and stony hillside. At least if you slipped you’d have a soft landing. This drift seemed to go on forever…..
….. and so did this one. Someone has even taken a bike ride over it. 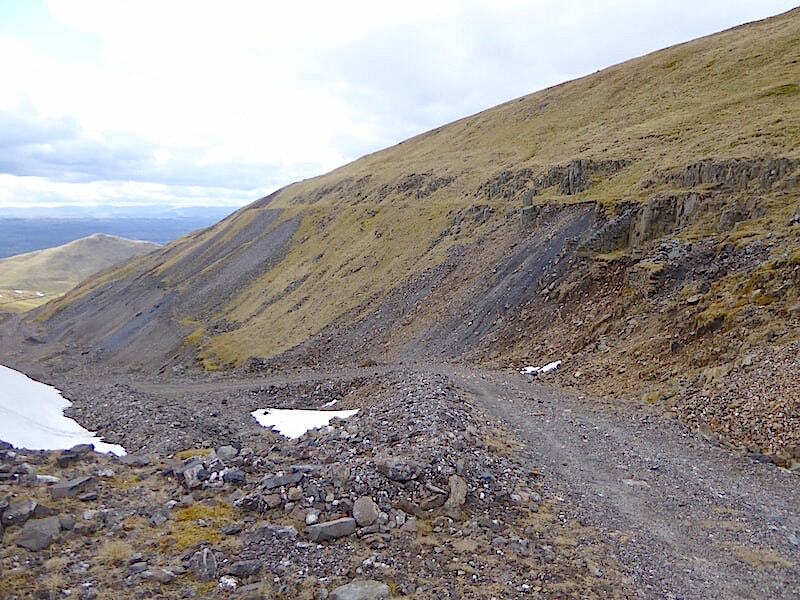 Back down along Threlkeld Side where all the old mine workings and derelict buildings reminded us very much of walking through the old mining areas on Coniston Old Man. Dufton Pike back in view below us as we continue down the rough track. 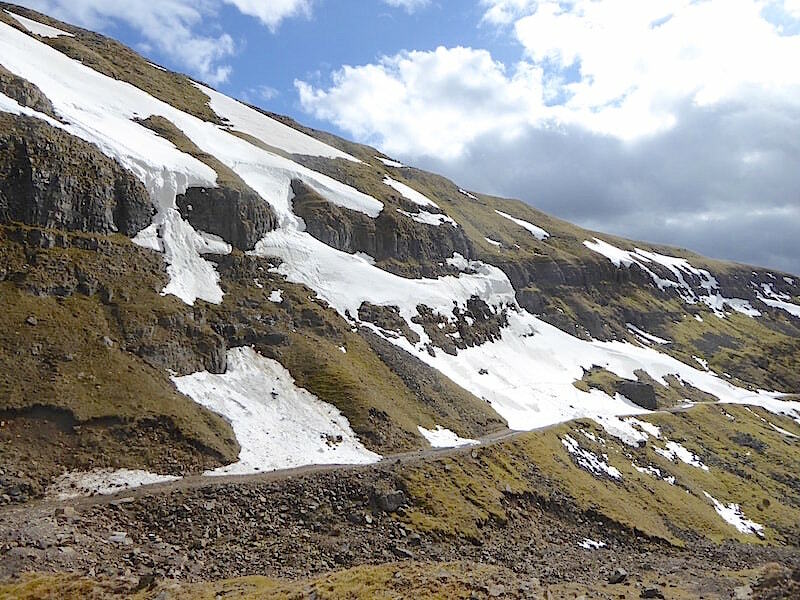 Back at the dodgy section of the track where the slippage on the various cornices is plain to see. 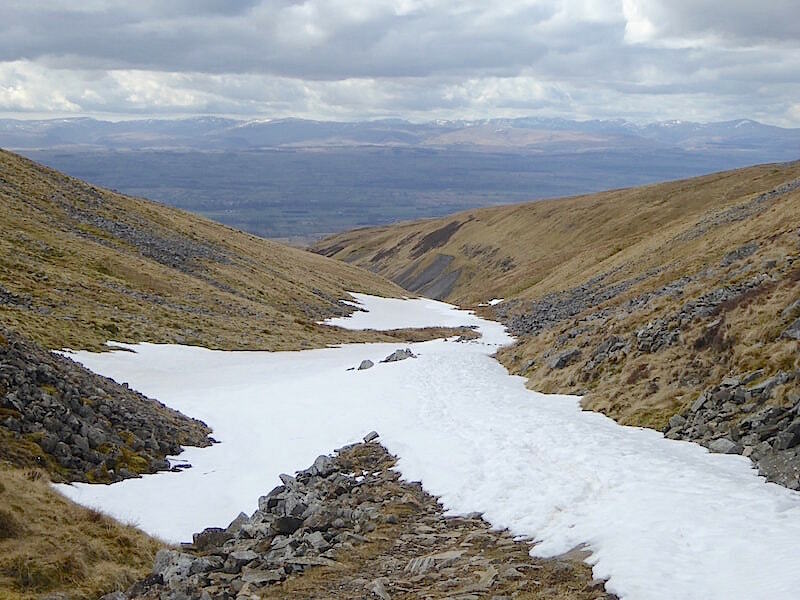 Once beyond the snow drifts the track is clear for an enjoyable tramp back down, until we reach the last drift at the bend in the track of course. 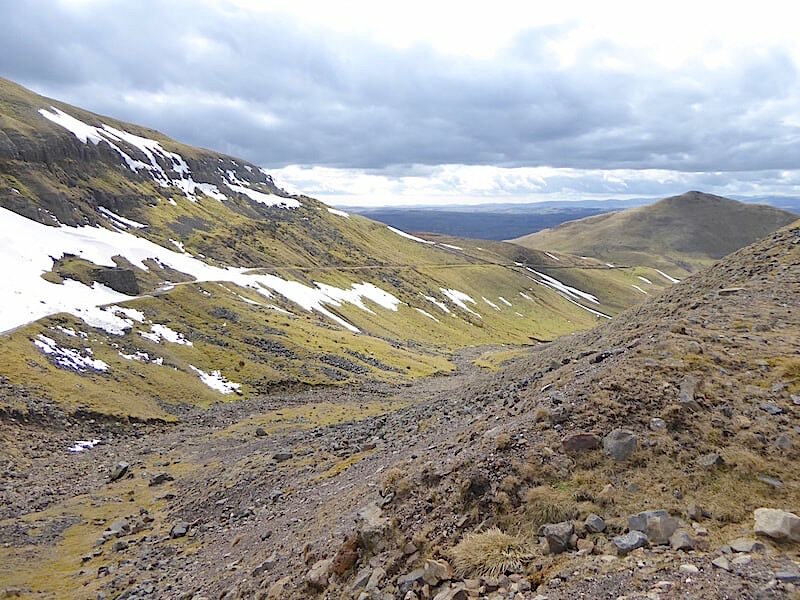 No pretty pretty scenery up here, its rough and harsh but despite that it has its own rugged magnificence and raw beauty. 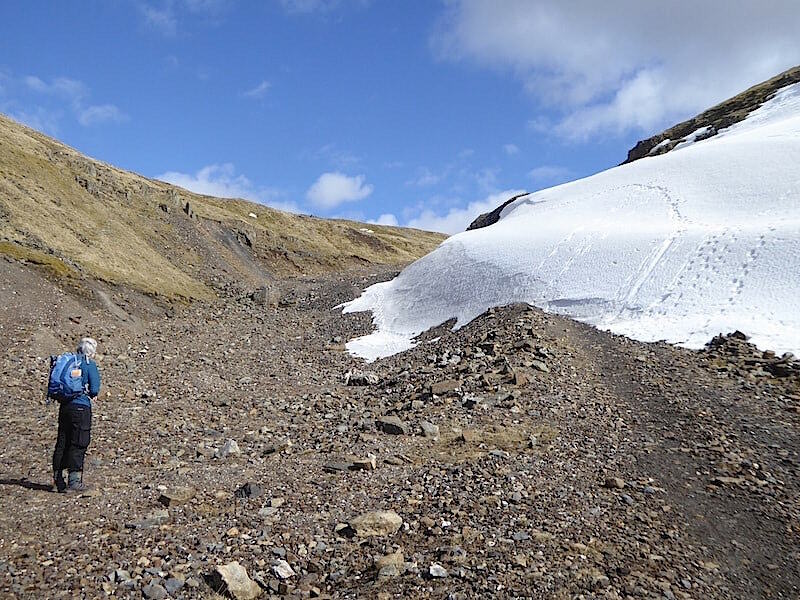 The conditions up here must have been beyond belief during the blizzards over the past weeks. The view along Great Rundale as we enjoy a steady stroll back down the track. No sound of gunfire during our walk so shooting wasn’t in progress today. 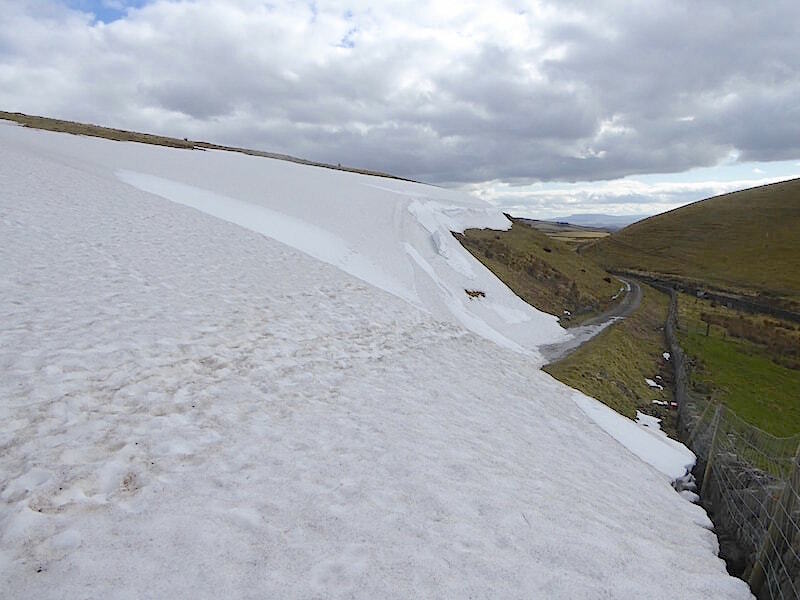 Back at the bend in the track and one last snowdrift to cross …..
….. and the view from the top of it, just as a splash of sunshine suddenly appeared. 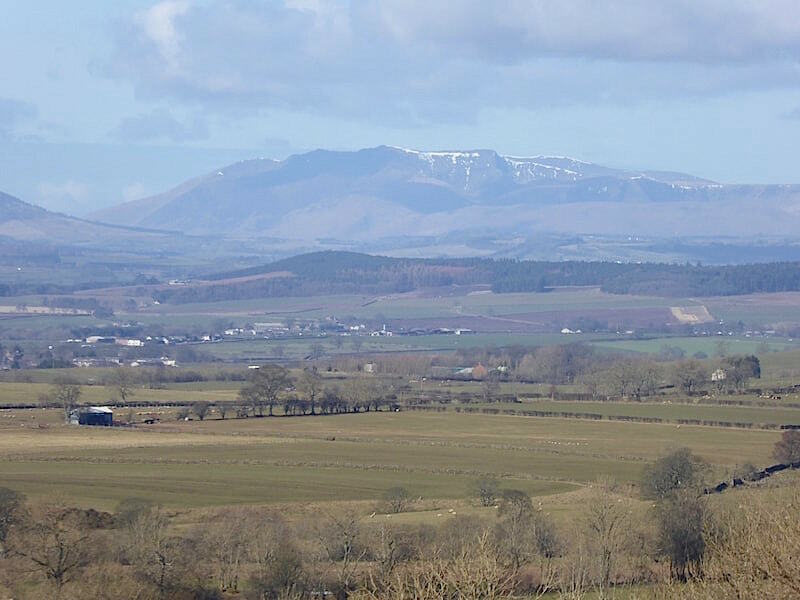 The view to the south as we round the foot of Dufton Pike. 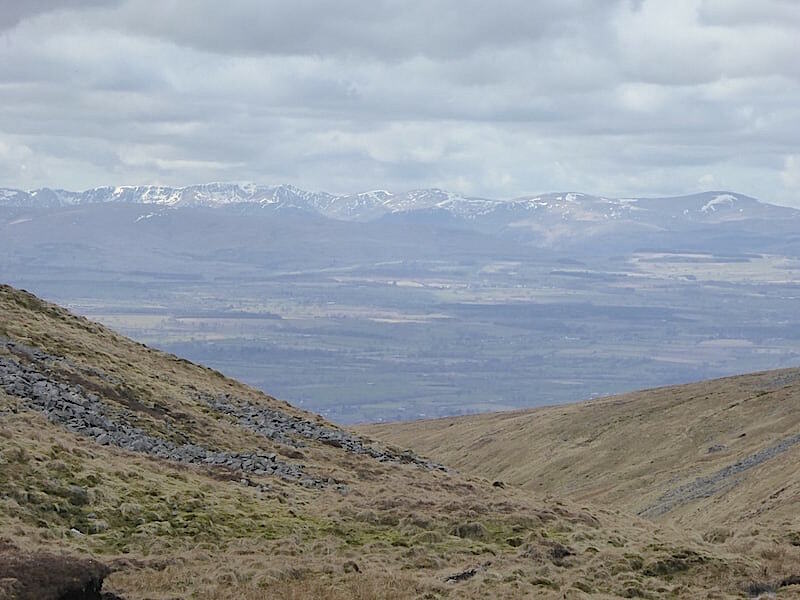 On the extreme left of the shot is Peeping Hill and tucked in between it and the lower fells on the centre skyline is the glaciated valley of High Cup. 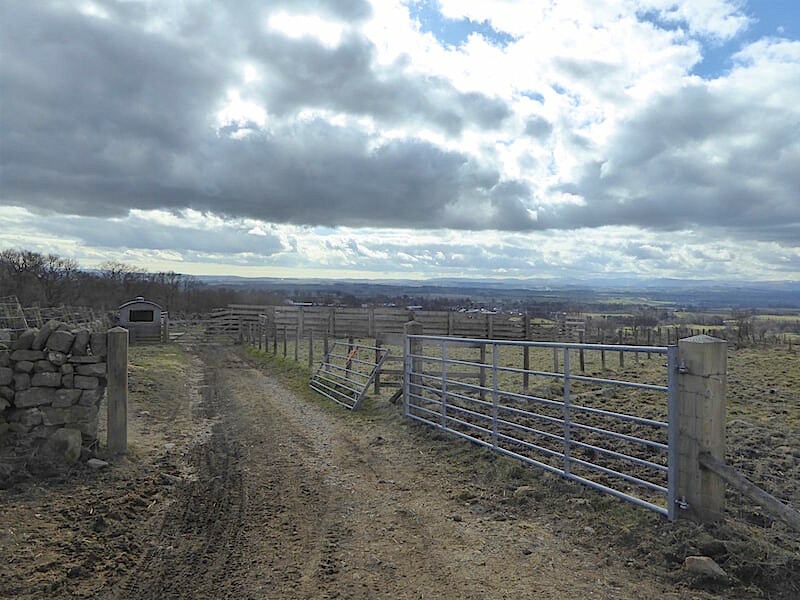 Back at the farmer’s storage shed we leave the open landscape behind and from this point the lane back down to Dufton is flanked by hedgerows, fences and walls which …..
….. is a very pleasant walk in summer when the trees and hedgerows are in full leaf. At the moment though everything is looking very bleached and washed out, and the shattered tree looks especially stark in the bright sunlight. Back at the top of Dufton village looking straight down the main street, where the car park is the second turning on the left in this view. Anyone seeking refreshment at this point should walk just a few yards further on and, depending on the type of refreshment required, can choose between The Stag Inn (CAMRA listed), located on the right hand side of the road from this point, or the Post Box Pantry (cafe and shop, open 10.00 am to 4.30 pm every day except Thursday) on the left hand side. 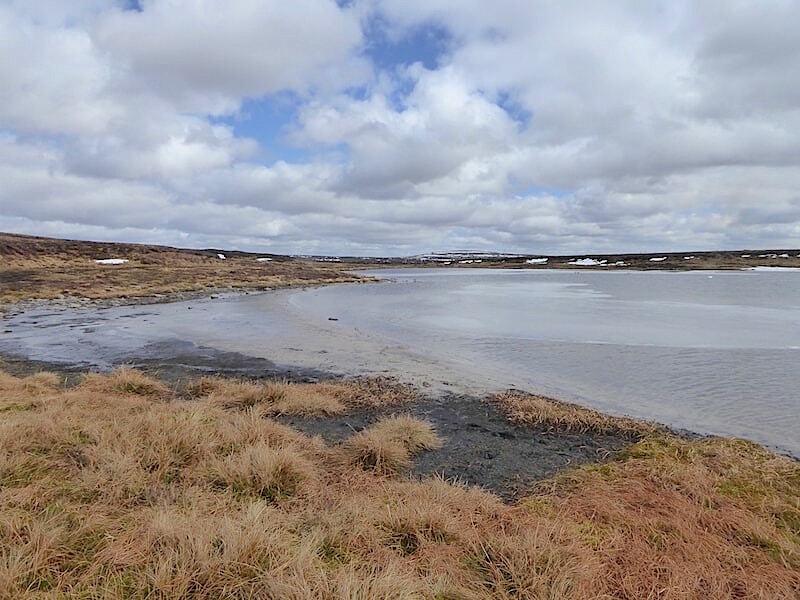 It looks like being a matter of wait and see as to when when we might be able to get out walking again as the weather doesn’t look as if its going to be very agreeable over the Easter weekend, mostly cloudy with a chilly easterly wind with occasional rain or sleet is the forecast. Fingers crossed that at least one day of the holiday weekend turns out to be better than any of that.